Landing Page Starter at startbootstrap.com is a device-agnostic, modern responsive design that is customizable. It's designed to work well on desktops, laptops, tablets and mobile phones. 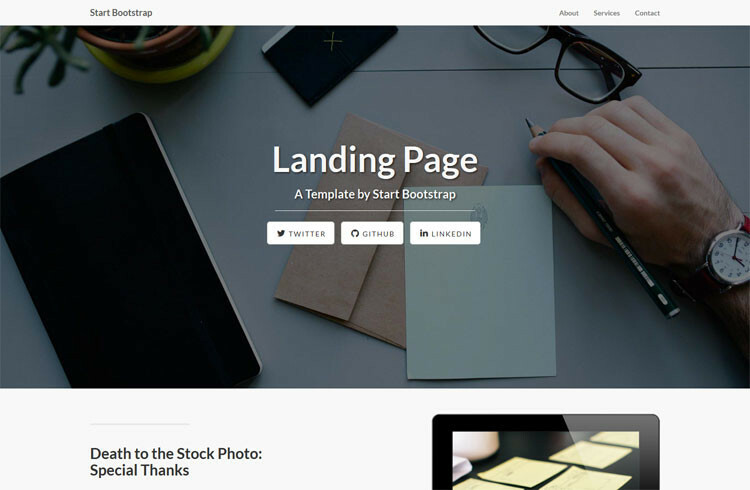 A responsive Bootstrap 3 landing page theme by Start Bootstrap. This one features a fixed top navigation menu, social buttons using Font Awesome icons, responsive content sections, call to action with a full page width background image, stock photography from Death to the Stock Photo and device mockups from PSDcovers. It's clean design is high-contrasting and photographic.